When Laine Young, a first-year PhD student in the Waterloo-Laurier Geography graduate program, was looking for a teaching assistant opportunity that aligned with her specialization in Human Geography, she didn’t expect to find one that also drew on the skills she developed in her undergraduate and masters-level social work degrees. That is until she found Laurier’s fourth-year Capstone Urban Studies Project (CUSP) course, which contains a unique community-engagement element. 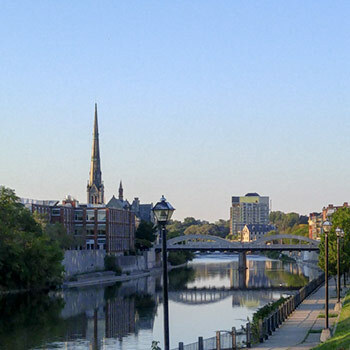 The CUSP course immerses senior-level geography students in the world of urban consulting as they present their recommendations for revitalization projects put forth by the City of Cambridge. Through this experiential learning opportunity, students can work collaboratively and put their knowledge into real-world practice. For Bob Sharpe, associate professor in the Department of Geography and Environmental Studies and CUSP instructor, the graduate teaching assistant (TA) is integral to the success of the course and its students. Sharpe and Young’s cohort of students were tasked with making recommendations for repurposing underutilized places of worship in Cambridge. Young saw opportunities to bridge her background in social work – specifically her experience with community-based, qualitative research projects – with the specific learning needs of the students-turned-consultants. With her knowledge, Young mapped out specific learning activities to support her students’ community-engaged learning experiences. Young incorporated religious sensitivity training into her lesson plans to prepare her students for working in places of worship. She led the class through Laurier’s Research Ethics Board requirements and procedures, reinforcing the professional and ethical responsibilities of student researchers. And, realizing the students’ proposals must adhere to the Accessibility for Ontarians with Disability Act (AODA), she and Sharpe arranged for Laurier’s Equity and Diversity Office to lead a session on AODA-compliant writing. The City of Cambridge awarded top merits to the student team who named themselves ‘Grand River Consulting Firm’ for their presentation on the adaptive reuse of the Central Presbyterian Church in downtown Galt. The team proposed that the church rent their Sunday school rooms to St. Louis Adult Learning and Continuing Education Centre on weekdays, creating a downtown location for their English as a Second Language program. A privately funded prize of $2,000 was awarded to the team for demonstrating professionalism in practice. “Serving as a TA in this course challenged me in a lot of ways, but I’ve enjoyed exploring theories from a new lens,” said Young, who plans to enrol in the University Teaching Foundations course offered through Laurier’s Teaching and Learning Centre in the fall of 2017. Academics aside, Young’s greatest success came from witnessing her students’ growth during the winter term.